THE U.N: GIVE THEM REPARATIONS! A United Nations panel of human rights activists asked the United States government to give reparations to the African-American community, who were the descendants of black slaves in America. 6. Domestic white terrorism (KKK). 7. Mass incarceration and police brutality , which disproportionately affect the African-American community, at a much higher rate than the rest of the population. 8. The 13th amendment. (Which permitted prison inmates to be used as slave labor. 9. Miseducation by a broken school system. Mireille Fanon Mendes-France, the chairwoman of the UN Working Group of Experts on People of African Descent committee, compared the police killings of unarmed black men today in the United States to racist lynchings that occurred in the South, during the height of segregation. There is a precedence for the United States giving reparations to American citizens, the first case is when the United States government gave reparations to Japanese Americans, for their harsh treatment during World War 2 and in 2015 the Obama administration earmarked $12 million dollars in reparations to be given to holocaust survivors. NO ONE WAS BORN HATING….. It seems like it’s the same old story all around the world, that being said I still have faith in humanity that we can evolve into a better people, be more Christ like and less first testament haha! I never thought there would be a black man in the White House, that was the leader of the free world. Yet a lot of the racist Trump supporters and the growing racism in America proves that racism is a infection you always have to keep an eye on and when it comes back like herpes, you can’t be afraid to give it some truth medicine . 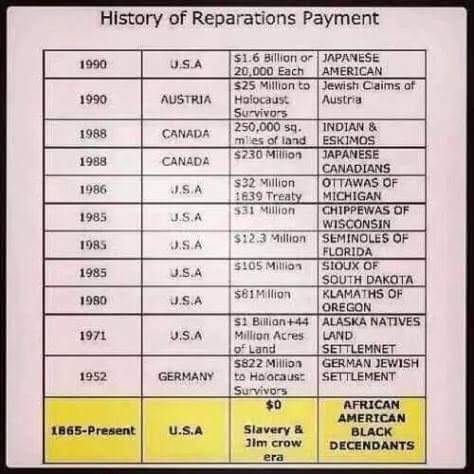 If the U.N wants to pay reparations then let them. I am sure that they expect this to be paid by the U.S. This is just another example of the global government seeking to divide and conquer.